So much hi-fi, so little time. That’s what it feels like on day one at Europe’s biggest gathering of the high fidelity clans, and to make matters worse they all have a press launch on the first day. But by the time the show was winding down I had a much better idea of what was worth hearing and what just looked extreme, there is never any shortage of that. 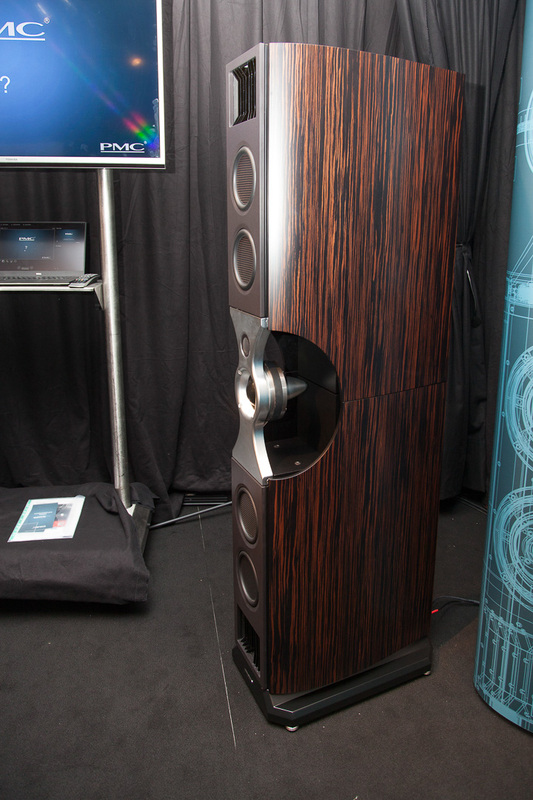 This year’s winner of the too much stuff for the room award goes to ESD a new Chinese company that has developed its own compression drivers, carbon fibre horns and class A solid state amplifiers. When you put ten of each in a glass room it gets quite warm. But there were many more sensible options some of which were almost affordable, the following were my highlights. Laurence Dickie’s designs for Vivid undoubtedly sound amazing but the aesthetics of the company’s Giya range are not for everyone. 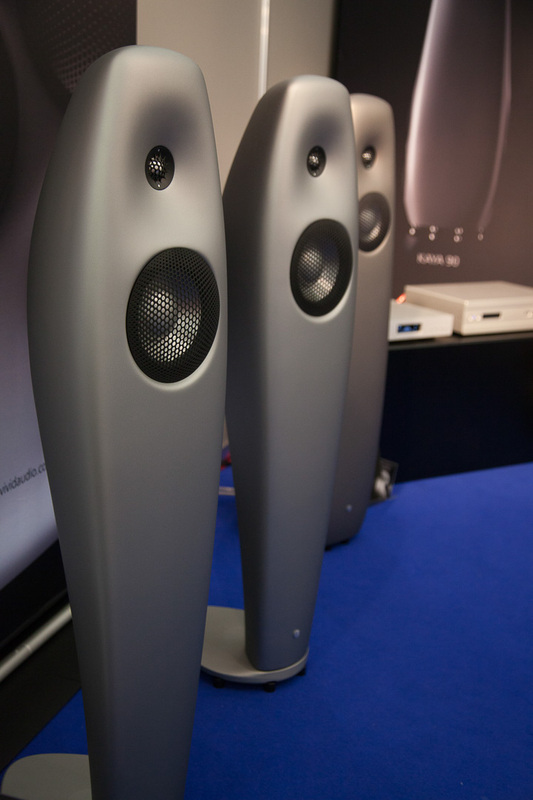 In an attempt to broaden their appeal Vivid has brought in external design talent and produced the Kaya range, this incorporates the composite cabinets with tapered tube rear loading, catenary dome tweeter and reaction cancelling bass drivers of other Vivid designs in a less radical form. The Kaya 25 (€9,000)has a slim integral stand and 125mm main driver while Kaya 45 (€16,400) is a floorstander proper with twin, side firing bass drivers. 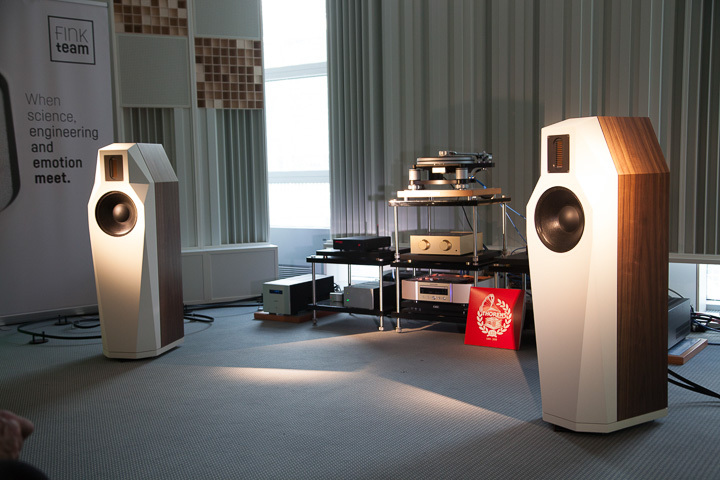 The Kaya 90 (€16,400) is a more substantial but curvy beast with two sets of side firing bass drivers that was demonstrating rather nicely with a vinyl front end. PMC’s Olly Thomas has gone for maximum vibration control in the new £45,000 factfenestria floorstander. 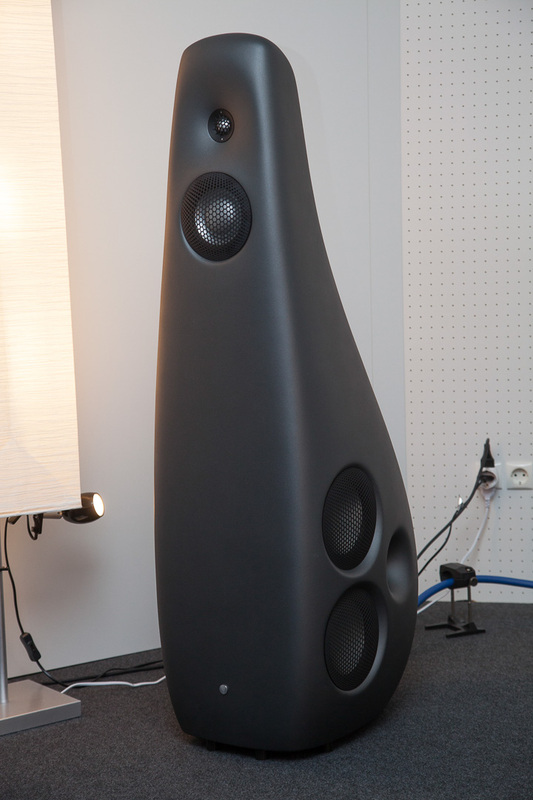 This 1.7m tall beauty consists of two transmission line bass systems atop one another with vents top and bottom, what sets it apart is the central aluminium section that holds tweeter and midrange domes. This is isolated on specially formulated mounts that stop energy from the bass systems getting to the drivers. The energy coming of the cabinet sides is cancelled by panels that are mounted in such a way as to work in antiphase, thus killing off a major source of colouration. The bass drivers are pretty unusual too and consist of flat sandwiches of carbon fibre with a foam core that deliver high SPLs thanks to their long throw. 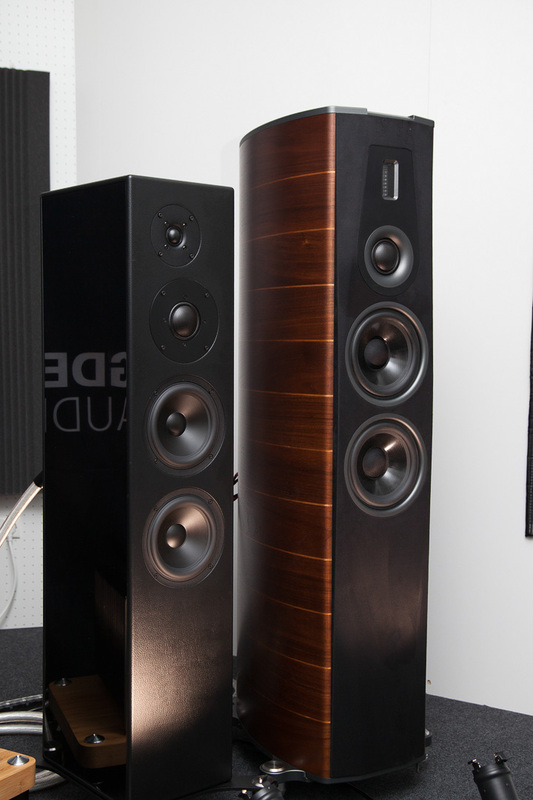 Patrick Miller of Sugden suggested I talk to Falcon Acoustics and when I got into their listening booth it became clear why, a full Sugden system was powering Falcon’s distinctly unFalconlike GC6500R (£18,000) floorstanders. 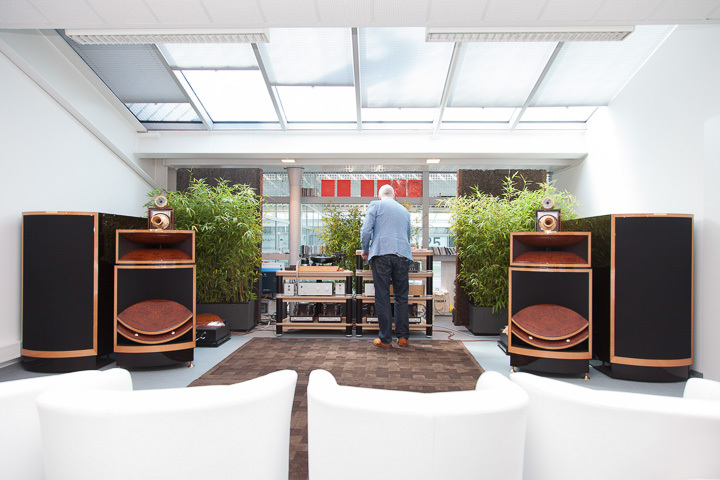 At a glance you’d think they were Sonus fabers but designer Graham Bridge has used 6.5inch graphene bass drivers, a 50mm midrange dome and a ribbon tweeter in a laminated MDF cabinet with down firing port. It’s smartened by Alcantara leather on the baffle and a glass top but there’s no disguising its power and resolution when playing tunes that you won’t find in an audiophile’s preferred listening list, that alone made this one of the most entertaining systems of the show. 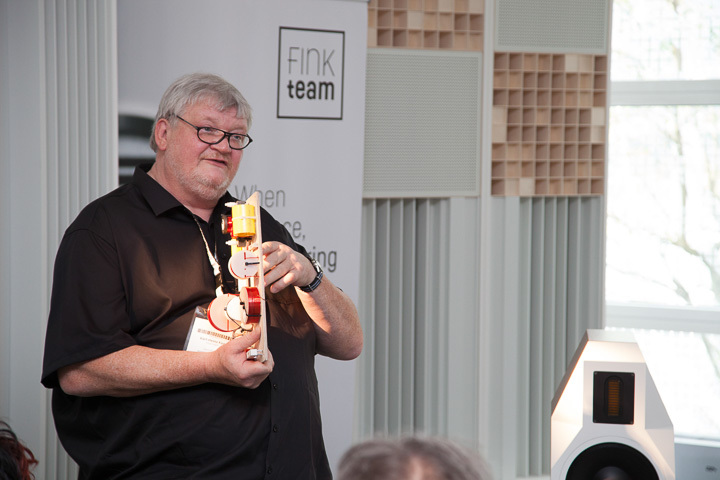 Karl Heinz Fink designs real world speakers for a variety of brands but in his spare time he gets the Fink Team together to combine drivers that really shouldn’t work. 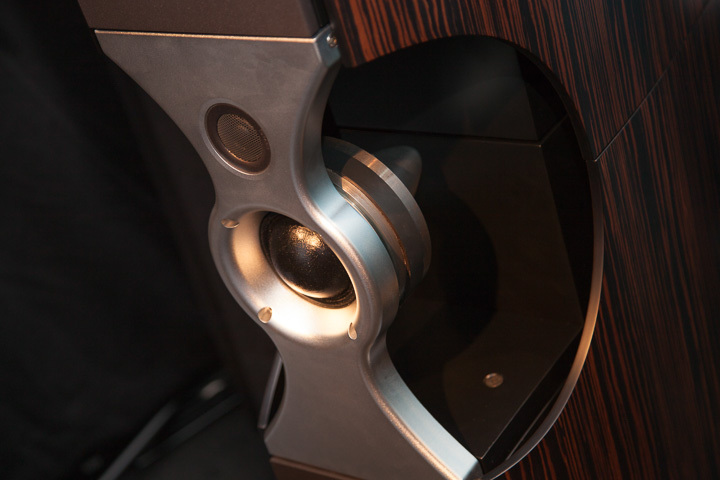 Borg has what looks like an old school 10inch woofer with pleated surround and an AMT planar tweeter, but the fact that the crossover point is at 1.6kHz reveals that this is no ordinary pair of drivers. The other novelty is an adjustable passive crossover to allow for different types of amplifier and source, different damping factor amps, image placement and HF output. No wonder it worked so well in an exhibition centre that’s largely made of glass. Nottingham’s Living Voice has become something of a fixture at the High End, they consistently make very convincing sounds with one of their multi box horn systems. This year the range topping Vox Olympian and Vox Elysian bass horn made a welcome return alongside new source components for the brand, Kevin Scott’s quest for a worth CD spinner has resulted in him modifying a Canary CD3000 (£7,500) Ken Ishiwata style. 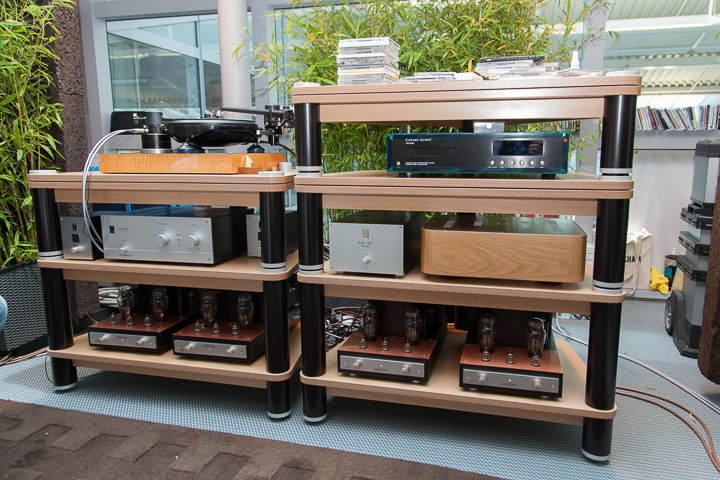 Living Voice launched a new equipment rack at High End, the G2 is a slightly simplified version of their G3 system with torsion rods in the legs and is priced at £21,400 for three tiers.